Hey Bennett, please introduce yourself to the readers and talk a little bit about what you do. My name is Bennett Foddy. I'm currently a junior professor teaching game design at the NYU Game Center, but until this year I was working as a philosopher at Oxford, and before that, Princeton. Before that, I made TV commercials for mobile phone ringtones, and before *that*, I played bass for the band Cut Copy. For the last few years I've also been making videogames alongside these other things. I made a few popular web games called QWOP, CLOP and GIRP, among others, and I am currently working on the compendium of multiplayer indie sports games known as 'Sportsfriends'. Ok, that brings everyone up-to-date on my life story. I imagine going from philosopher to game designer was an interesting journey. Have you experienced any overlap between your studies in philosophy and your studies in game design? So first of all, I'm not really *studying* game design, I'm just sort of doing it and teaching other people to do it. My approach to it is less analytical than my approach to philosophy, or at least I think I bring analysis to my game design after the designs are made, rather than as a means of bringing them into being. Having said that, though, I guess my outlook is the same in a broad sense, whether I'm working on philosophy or making games. My undergraduate advisor, Graham Priest, once defined philosophy as 'unbridled critique', which I think is also a good definition for a healthy artistic process—everything is open to question and critique, nothing is taken for granted. I actually like game design more than philosophy in this sense. It is much more unbridled! Most of your games use physics in fun and unexpected ways. What drew you to physics based games initially, and how do you usually go about designing them? I guess the real answer to this is that I was captivated by the pioneers. The closest thing to QWOP that came before is Ski Stunt Simulator by Michiel van de Panne, a professor at UBC. I was also totally obsessed with the 1997 indie motorbike game "Action Supercross" and its later sequel Elastomania, which paved the way for games like Trials. But before that, I loved many simpler games with granular, physics based controls — like Gravitar, to take an obvious example. What was it about these games that fascinated me? I think part of it is that there's a sense that in a simulated world, things can happen that were not explicitly intended by the creator. In Super Mario Bros there is an explicit maximum to the height of your jump. In a game with a physics model — even a simple model like in Quake — you might realize you can create an explosion beneath your feet to propel yourself higher. The more a game depends on physics for its effects, the more of these weird effect present themselves. This is why not many games use physics to control every movement. Setting up a physics game is more difficult than most people realize. Computer physics engines deal best with small, unconnected bodies that do not exert much force on each other. When you make a game with complex ragdolls or flexible poles, and try to use these complex objects to exert high forces on other movable and immovable objects, it is very hard to keep it from glitching out. Most people compensate either by making the physics very floaty and massless or by allowing bodies to penetrate each other—think of the ragdoll corpses in Dark Souls, for example. If you compare QWOP to my more recent physics games, like Get On Top, you'll see I got a lot better at making the physics interactions heavy, brutal, and stable. So when I start designing a physics-based game, the first task is always to set up a believable world. The challenge in your games usually stems from a seemingly trivial task, such as walking in QWOP or climbing in GIRP. I was particularly impressed with how well GIRP mimicked the feel of rock climbing by representing each rock with a different key. How did you go about translating the feel of these arm and leg activities into finger based challenges? Most games give you control over high-level concepts: 'move left', 'attack', 'heal', and so forth. I guess I've always been interested in games that delve into the low-level mechanics of basic actions. QWOP is definitely not the first game to do that! Atari's 1979 arcade game Lunar Lander, which asks you to move by firing thrusters, is the obvious example. But I also loved Sierra's Lightspeed, which asked you to repair and optimize your ship's systems by dragging electrical components around with the mouse. Anyway that doesn't help to explain how I came up with the control scheme for GIRP... that happened sort of by accident. I had the idea of making a rock-climbing game about a year before I came up with the idea for GIRP. I had made these cliff-face graphics (which I eventually ditched) but I didn't really have a good idea for a control scheme... I think like Tri-arachnid or like Chris Hecker's abandoned rock-climbing game, I was planning some kind of mouse-based drag-and-drop mechanic. Anyway I was trying to figure out how to make these brick-like rock segments mesh together nicely, and I started looking at the keys on my keyboard as a rough representation of the bricks, trying to visualize how the graphics would work. And then an hour or two later, when I was out in a cafe talking about something different, the two ideas kind of melded together in my head and it became clear what the control scheme should be. I guess like Lunar Lander it's a relatively low-level mechanic ('reaching' instead of 'climbing'), and that's probably why it immediately appealed to me when I had the idea. GIRP is definitely the game that I'm most proud to have designed. Part of the enjoyment in your games comes from the comedic ways the player fails when the physics don't behave as expected. The short backstory in QWOP and the dialogue in CLOP are among the few examples of scripted humor. How important is humor to you in designing each of your games, and do you find it more difficult to achieve in games than in other mediums? I guess I think that humour and play are generally good friends. I love playing serious political games, and serious emotional games, but at least when I'm making my own stuff I try to keep it playful. I have unlimited energy for adding goofy gags to my game, and it never feels like work. I'm definitely not alone in this! The history of games has some amazingly funny moments, both intended and unintended. 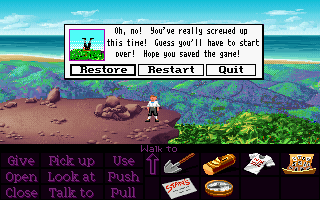 Like the time Monkey Island lied to you and told you that you died by falling off a cliff. Or, who can forget that time Carroll kissed Fabianski in FIFA 12? Still, I guess if we're honest, comedy is primitive and underdeveloped in games compared to how it is used in other media, and maybe that's why I'm mainly using slapstick and cruelty in my games, the two oldest comedic forms. But... I actually think that because games are interactive, they have the potential to be funnier than books or movies. Because players provide half of the content of any game, they have the opportunity to become the comedians, by exploiting unintended physics glitches, or by inventing hilarious new challenges or hacks, by recording 'Let's Play' videos, or by trolling other players and even the characters in the game. I feel like the best thing about my games from a comedic perspective is that they've created a platform for online humorists to express themselves. The way you describe humor in games almost echoes the debate between emergent and linear play, for most of the humor you describe comes from the player interacting with the system in a comical way, but it isn't always intentional. Do you have a strong preference for any particular style of play, and are there any current experiments in play style that you strongly like or dislike? As a player of games, what I'm interested in above all else is the variety of ways in which games can make you care about how you're playing them. Sometimes that means that you care about playing a game well, perhaps because you're competing against a friend, or because you paid money for a credit at the arcade, or because you're trying to beat your high score. Sometimes it means that you're trying to play expressively, because you're invested in the game world and the narrative in it. Both of those things work well with a linear style of gameplay. But I guess sometimes you can start caring about how you play a game because you're playing it creatively. Sometimes a game is designed to bring out creative play by offering the player construction systems, like The Sims or Dwarf Fortress. Sometimes you can be creative about inventing strategies for playing a competitive game, or inventing new 'house rules' or metagames—for example, I just linked you to a video of people playing Super Mario 64 where they make a game of avoiding the 1-up mushroom. I like the trend of 'permadeath runs' in these modern ultra-easy AAA games, and in fact that's how I played Red Dead Redemption, which was a pretty amazing experience for about 4 hours until a bandit tricked me into getting off my horse and getting eaten by wolves. I'm fascinated by the evolution of new jumping styles in the Olympic high jump. One of my favourite moments regarding my own games was when I got copied in on an impromptu high-level rivalry between the world's two best GIRP players: Alan Hazelden, a fellow indie game developer who just released Sokobond, and Paul Cook, a retired mathematician who told me he didn't normally play games but had become interested in GIRP. Both are avid amateur jugglers. They were speed-running GIRP, getting faster and faster and finding new creative ways to exploit the mechanics and the course. When one would cut 30 seconds off the time, the other would give up, for a while, and then come back with yet another exploit. I think Mr. Cook finally took the crown with an incredible 3'09" run, something I would definitely have considered impossible if I hadn't seen these videos. So I try to make games that support this kind of play. As I am fond of saying, videogames set up imaginary situations in imaginary worlds, and so by default the events in a game don't matter at all. Yet good designers and good players, together, find ways to make them matter a lot. While we are on the topic of competitive play, what are your thoughts on e-sports' recent jump in popularity? It's interesting to me that most e-sports games eschew physics in favor of tangible possibilities for an individual move, while professional sports are bounded by the laws of physics and therefore seem more prone to unpredictable outcomes. There are no "weird bounces" in League of Legends, for example, like you might see when a baseball hits a corner at an odd angle. So, Doug Wilson pointed out to me the other day that Pole Riders (and the new version I'm working on, Super Pole Riders) is one of very few competitive multiplayer videogame that uses a proper physics engine, rather than a deterministic set of rules that generate physics-like interactions. The possibilities in strategy games like League of Legends are super-bounded, but even in action e-sports like Halo or Street Fighter (which have precise representations of collisions, gravity and mass) there can be no such thing as a 'bad bounce'. I actually don't think designers do this out of a sense that it is fairer to remove randomness from an e-sport. There are random factors in longstanding competitive games like Backgammon and Poker, and even cricket—the second most popular game in the world—starts with a coin toss. I think the reason randomness is expunged from the simulated worlds of modern e-sports is that it creates huge problems for writing the prediction code that makes an e-sport feel responsive and not laggy over an Internet connection. If you want to write a game with lots of granularity and/or randomness in the simulated world, you really can't play it over the internet. So I guess I'm really happy about the recent jump in the popularity of e-sports, but this is a big part of why the popular e-sports games are not all that interesting to me. The other part, naturally, is that all the best videogame experiences in my life have happened with another person physically present. What I want to do is to make and play local multiplayer games, and in that arena I can bring in real laws of physics with all their analog unpredictability, and all the drama and excitement that come out of that. Thankfully, I think local multiplayer games are enjoying a boom too, albeit on a smaller scale. You recently released a game for OUYA. What was that process like, and what are your impressions of the console so far? Shay Pierce handled the port for me, so I can't really speak to it from the developer's point of view, I can only report to you as a player and as a publisher. I really love some things about the Ouya, like the incredibly frictionless process of writing an app and publishing it, and then the even smoother process at the player's end, downloading and installing games. It has the potential to be this amazing, revolutionary thing for players (especially young players) and developers. Right now, though, the revenue really isn't there and the hardware isn't quite there either. In particular, the controller lag is a problem, although they say they're fixing this in the next hardware revision. I'm worried that if Apple ever gets around to delivering their much-rumored Apple TV update with the game controller and the iOS app store, Ouya is hosed. And I guess this means they have about 3 months left to hit their stride. If I was in charge there, I'd spend some of that $22 million in funding and pay some poor, brilliant indie devs to bring their very-nearly-finished games exclusively to Ouya instead of the App Store, Android store, Kongregate, Adult Swim, or consoles. But I obviously don't know anything about Ouya's financial situation, and maybe the plan that seems so obvious to me was unrealistic or impossible to them. It's easy to criticize from the armchair. We'll close out this interview with a little talk about your future. You recently joined the NYU Game Center as an assistant professor. What attracted you to the opportunity, and what do you hope to accomplish at the university? I had reached a point in my career as a philosopher where I knew I wanted to switch to games full-time. Every time I came out to New York (to show games at No Quarter or Babycastles, for example) and every time I would go to GDC in San Francisco, it was pretty clear that videogames had become a better fit for me, even though my philosophy career was not going badly. So I guess I knew that I was either going to switch to a job as a game design professor or just a full-time game designer. And I was pretty sure I didn't want to work as a designer in a large team or at a company, at least for now. The job at NYU ticks a few boxes for me that solo game development doesn't. It gets me to New York, where there's a super-exciting scene and a LOT of great people (including all the Sportsfriends!). I'm mostly making multiplayer games at the moment, which really tough to do when you're working at home in your underwear! You need people around you. So I guess it feels like this is a healthier situation both in a creative sense and in a psychological sense, and I'm surrounded by brilliant designers, running a super-exciting program. And it's in the best city in the world. I couldn't ask for more than that. As far as what I want to accomplish, it's pretty simple. I want to grow as a designer and as an implementor of games, and I want to help my students to grow with me. I have a really long way to go.